Celiac disease is the intolerance to gliadin, a component of the protein gluten. When a person with celiac disease ingests gliadin, it triggers an inflammatory response in the intestinal mucosa, resulting in the malabsorption of food nutrients. Almost all of the cereal types that are cultivated and consumed in Europe and the United States contain gluten. In the Western population, it is estimated that about 1 in 100 people have celiac disease. However, the incidence rates vary strongly between regions, with the highest rates found among white Europeans. The trend is rising and it is assumed that there is a high number of undiagnosed cases due to very mild forms or delayed courses of the disease. What causes celiac disease has not been conclusively clarified. There is, however, a strong genetic disposition: The receptor proteins HLA-DQ2 or HLA-DQ8 can be found in almost all patients with celiac disease. Note: Many autoimmune diseases are associated with celiac disease. Gliadin triggers an inflammatory response in the lamina propria of the small intestine. An often tested fact: In gluten-sensitive persons, the enzyme tissue transglutaminase (tTG) connects gliadin with proteins of the connective tissue, forming new antigen structures. These structures, in turn, trigger destructive inflammation processes in the mucosa of the small intestine which results in lymphocyte infiltration and villous atrophy. The inflammation diminishes the resorptive surface of the intestine and leads to severe malabsorption and maldigestion of all food nutrients. 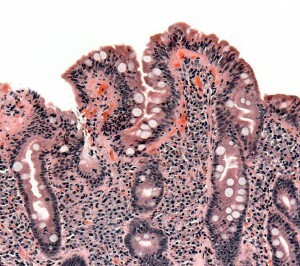 Celiac disease is characterized by mucosal changes, especially the blunting of villi, crypt hypertrophy, and inflammatory infiltration of cell structures into the mucosa. The appearance of the mucosa can vary, from inconspicuous mucosal folds to fold scalloping and even completely reduced mucosal folds. In a much progressed stage, even a narrowing of the Kerckring folds can be found. Note: Villous atrophy, crypt hyperplasia, and lymphocyte infiltration are characteristic histological findings for celiac disease. About 3 to 4 months after introducing an infant to cereal products such as porridge or bread, i.e. starting with the second year of life, first symptoms may manifest. 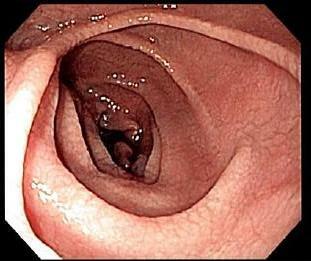 If celiac disease is not recognized as such, serious sequelae might develop. Note: Also with adult patients or when the clinical presentation is not comprehensive, celiac disease should still be considered. As mentioned above, starting with the second year of life, attention should be paid to any failure to thrive and to unusual signs of mood swings or severe diarrhea. Important hint: The first clinical diagnostic evidence for suspected celiac disease can consist in the detection of IgA and IgG endomysial antibodies against gliadin (gluten-sensitive enteropathy). Increased levels point to celiac disease and can cause dermatitis herpetiformis, a chronic skin disease marked by herpes-like vesicles and strong pruritus. Positive evidence of IgA antibodies against tissue transglutaminase can be a further indication for the autoimmune celiac disease. Transglutaminase antibodies are autoantibodies that are directed against certain structures on the inside of muscle cells. 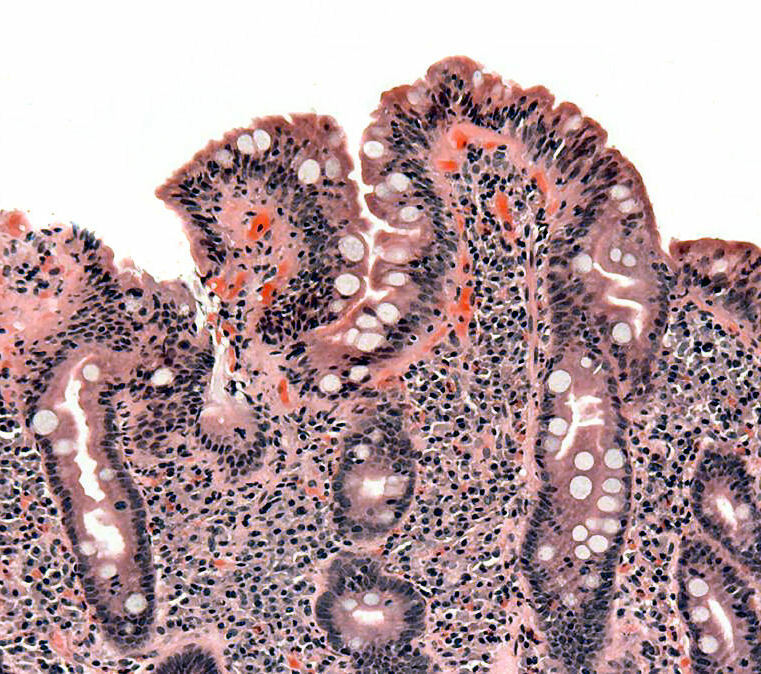 General screening for antibodies can increase the chance of detecting celiac disease early, but only a biopsy of the small intestine can provide a definitive diagnosis. Note: For exams, it is important to know about tTG antibodies, anti-gliadin antibodies, and endomysial antibodies. Based on dietary history, weight gain patterns, and clinical findings including laboratory and imaging studies, further diagnostic considerations can be explored. Celiac disease is incurable; however, the right diet and lifestyle can provide for the unproblematic management of this disease. Gold-standard treatment is a permanent gliadin-free diet, which excludes any food products that are based on cereal grains like wheat, rye, oat or barley. At the beginning, an additional substitution of vitamins and iron accompanies this diet, and soon, the mood should improve, the appetite increases and diarrhea should be diminished. Food products based on rice, corn, soy beans, potatoes, nuts, or carob flour are unproblematic. A gluten-free diet should result in normalization of the IgA endomysial antibody titers. There are investigations into supplemental medication, especially for oligosymptomatic patients, to increase their tolerance of minor amounts of gluten. Most efforts are currently aimed at the development of transglutaminase inhibitors. A protective influence has been attributed to breastfeeding—also against other allergic diseases. Currently, there is a European study being performed regarding a possibly protective effect the introduction of minimal doses of gluten into baby food might have. 1. Which antibodies should be screened for when suspecting celiac disease? 2. What are characteristic histological findings for celiac disease? 3. In which year of life do the initial symptoms of celiac disease typically, but not necessarily, occur? Bower, S. L., Sharrett, M. K., &Plogsted, S. (2014). Celiac disease: A guide to living with gluten intolerance. In Langwith, J. (2012). Celiac disease. Detroit: Gale Cengage Learning. Libonati, C. J. (2007). Recognizing celiac disease: Signs, symptoms, associated disorders & complications. Fort Washington, PA: Gluten Free Works Pub. Williamson, D., & Marsh, M. N. (n.d.). Celiac Disease: A Brief Overview. Celiac Disease,001-009. doi:10.1385/1-59259-082-9:001.